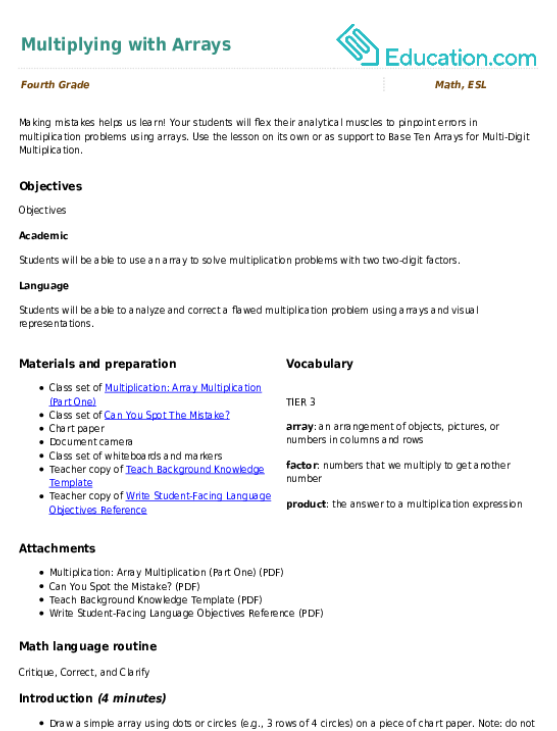 This lesson can be used as a pre-lesson for the Factors Over the Rainbow lesson plan. Class set of Factor or Not? Students will be able to find all factor pairs for a given number. Students will be able to distinguish a factor from a non-factor and explain their reasoning using sentence starters and interactive supports. Ask students to turn to a partner and share their background knowledge on multiplication. Ask the following guiding questions to spark conversation: "What does multiplication mean? When do you need to multiply numbers? How do we show or represent multiplication?" Listen in on students' conversations and have them share with the whole group some of their key points. Guide students to the understanding that multiplication is when you add a number to itself a certain number of times. Some ways we can show multiplication include arrays, repeated addition, equal groups of items, a multiplication chart, etc. Record students' ideas and important points from the discussion on the board. 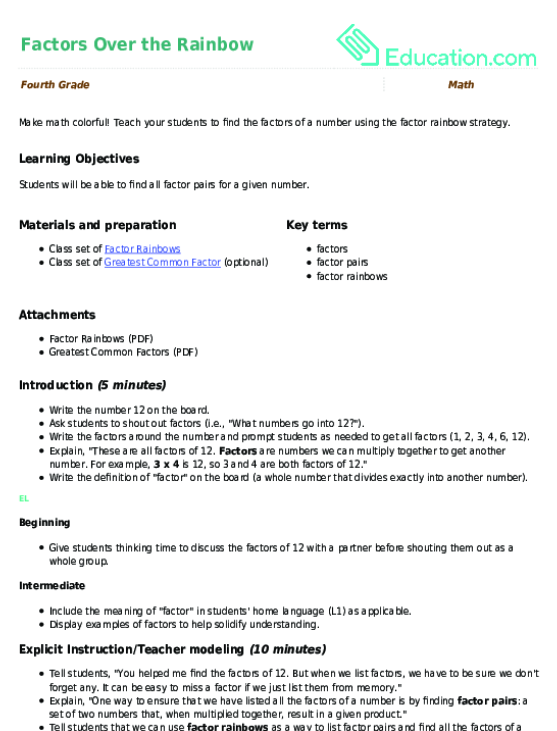 Explain that today we will explore an important concept related to multiplication called factors. Introduce the vocabulary words to the students by displaying the vocabulary cards, one at a time, on the document camera. Read aloud the word, its definition, and describe the image if available. Ask students to share additional information or examples they have on the vocabulary terms and add them to the vocabulary cards. For example, if students know the synonym in their home language (L1), add it to card. Focus on the concept of factors. Explain that it is important to be able to find all the factors of a product because it helps us understand various ways to make the number and it also helps us connect multiplication with division, which happens to be the inverse, or opposite, operation. Show students how to find the factors of the number 8 with the factor rainbow strategy. Draw an arch with 1 at the end of the arch and 8 at the other end. Explain that one and the number itself are always factors of the given number. The next step is to draw a smaller arch under the first arch and ask yourself, what other two numbers can be multiplied to get the product of 8? Tell students that it is helpful to try dividing the product by small numbers such as 2, 3, and 4 to see if they are factors. Since multiplication and division are inverse operations, we can use both operations to help us find the factors. In this case, 2 x 4 = 8 so write 2 and 4 at each end of the arch. We can also think of it as 8 ÷ 2 = 4. We now know there are no other factors of 8 since 3 did not work. This means that the factors of 8 are 1, 2, 4, and 8. Model rainbow factorization with another number such as 12 or 16. Explain to students that finding the factors essentially means that we are separating the product evenly. For example, say, "If I had 15 cookies, I wonder how I could break them up into equal groups. I realize that the factors 1 and 15 mean one person could have all 15 cookies or 15 people could each have one cookie. The other factor pair is 3 and 5 which means that 3 people could each get 5 cookies or 5 people could get 3 cookies." Place students in partnerships and give them scratch paper or their math journals. Have them try the rainbow factor strategy with simple numbers such as 10, 15, or 18. Have students volunteer to share their math work on the document camera. Provide the following sentence starters to help students share. "First, we drew an arch and wrote..."
"Then, we divided ____ (product) by 2/3/4 and discovered that ____ and ____ are also factors." "All the factors of ____ (product) are..."
Listen in on students' responses and correct any errors in their math thinking. Ask students to consider how they might find out if a number is not a factor of a product. Sample answers include: "If we can't multiply the number by another number to get the product," or "If we divide the product by the number and we can't get a whole number as an answer, then we know it's not a factor." Distribute the Factor or Not? worksheet to students and display a copy on the document camera. Read aloud the directions and explain the structure of the table provided. Tell students that they will work with a partner to complete the table. Explain that the paragraph frame is given to provide them language support to explain their math thinking process. 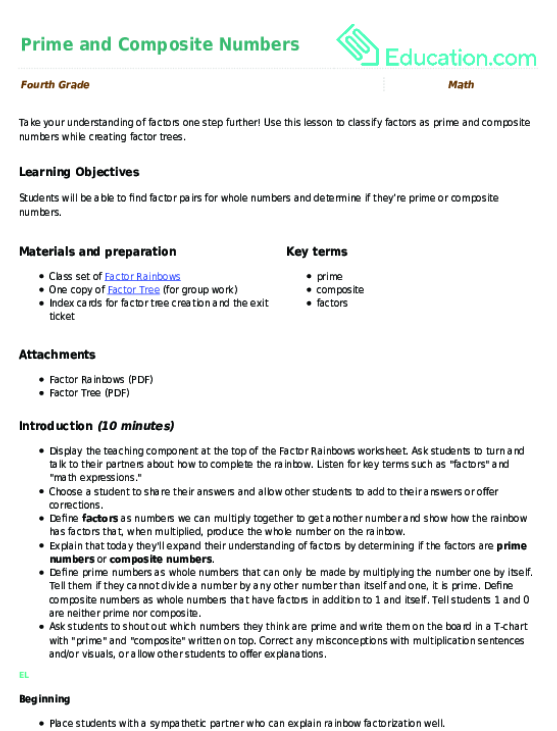 Hand out scratch paper to each student and tell them to use the rainbow factor strategy to help them determine which number does not belong in the factor list. Call on a student to help you model how to work together and discuss the answer. Tell students that both partners should look at the second row in the table and consider the information. For example, say "The product is 15. The table lists the factors as 1, 3, 5, 7, and 15. I will do the factor rainbow strategy on my scratch paper. I discover that the factors are 1, 3, 5, and 15. So I realize that 7 is not a factor because we can't multiply anything by 7 to get 15. Do you agree?" Give the students a chance to agree or disagree before completing the paragraph frame together. Allow ample time for pairs to complete the worksheet together. Encourage students to talk through the problems and any disagreements that arise. Have some students share their responses with the whole group. Make sure they provide their reasoning in complete sentences. Allow students to explain the process of solving the problems in their home language before rephrasing using sentence stems/frames in English. Have students work in a small, teacher-led group during group work. Create and display a word/phrase bank with helpful terms from the lesson for students to refer to, with images if applicable. Place students in specific partnerships based on their language needs. Have students share their answers aloud without referring to the sentence stems/frames for support. Allow them to utilize glossaries and dictionaries for challenging words. Have learners repeat and explain key vocabulary for the class. Distribute an index card to each student. Have them write their name on it. Instruct students to use the rainbow factor strategy to find all the factors of the number 32. Tell students to refer to the sentence frames/stems written on the chart paper earlier in the lesson as they share their work verbally with a partner. Have students turn in their index card as an exit ticket formative assessment for this lesson. Tell students that it is essential to know the factors of a number because when we can break down a number into smaller pieces, we are able to work with larger numbers more easily. Knowing how to distinguish or differentiate between a factor and a non-factor of a product will also help us later on when we learn more complex operations such as long division. Teach your students to find the factors of a number using the factor rainbow strategy. Use the lesson on its own or as support to Base Ten Arrays for Multi-Digit Multiplication.